The news last week that the number of 16 to 24 year olds in England not in education, employment or training (NEET) reached an all-time high was widely covered, and quite shocking since there are now 1.16 million 16 to 24 year olds in this category. 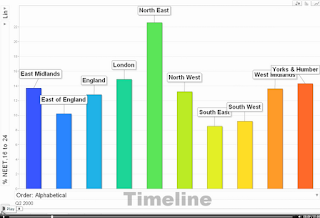 I thought it might be quite interesting to look at the data more closely to see how it compares to other time periods. The Department for Education publish the NEET data on a quarterly basis and the most recent data are for the third quarter of 2011 at the regional level. "What would the quarterly data look like in an animated bar chart? ", I hear you say. Click the image below to find out! Click to see a full size version of this animation. I should say that you'll need to watch the clip a few times in order to make sense of it (and use the pause button), but once you get your head round it, it tells an interesting story (it also dances a bit like an equalizer on an old stereo). The lowest NEET total for England was in the second quarter of 2000 (629,000) and the highest total comes from the third quarter of 2011 (1,163,000). The highest regional percentage figure for NEETs was in the third quarter of 2011 in the North West (23.9%) and the lowest was in the last quarter of 2003 and the first quarter of 2004 in the South West (7.4%). Lots of interesting stories here but the most striking thing is the total number of NEETs in England. Note: I created this using Google's motion charts and recorded it using Camtasia. 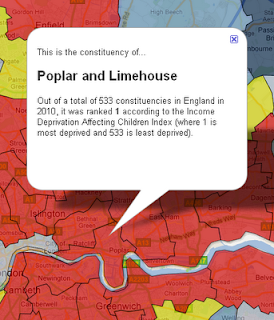 The really noticeable thing here is the number of London constituencies. In the general IMD for England, it is areas in the North West which dominate, but not here. As to why this is, there are many reasons but that's not the point today. Why not explore the national patterns on the map and see how your area compares (if you live in England). The most important thing about all this is, of course, the fact that so many children in England are adversely affected by income deprivation. Learning from the past in regeneration? Last week, a government select committee published their report into regeneration. This was all about regeneration (and its failures) in England, but much of it resonates more widely. Before I mention what was in the report, it is worth noting the composition of the committee: 5 Labour MPs (including the committee chair), 6 Conservative MPs, 1 Liberal Democrat MP. I should also mention that last week a paper of mine was published. This is significant not because I had something published (!) but because the paper was entitled 'Learning from the Past? 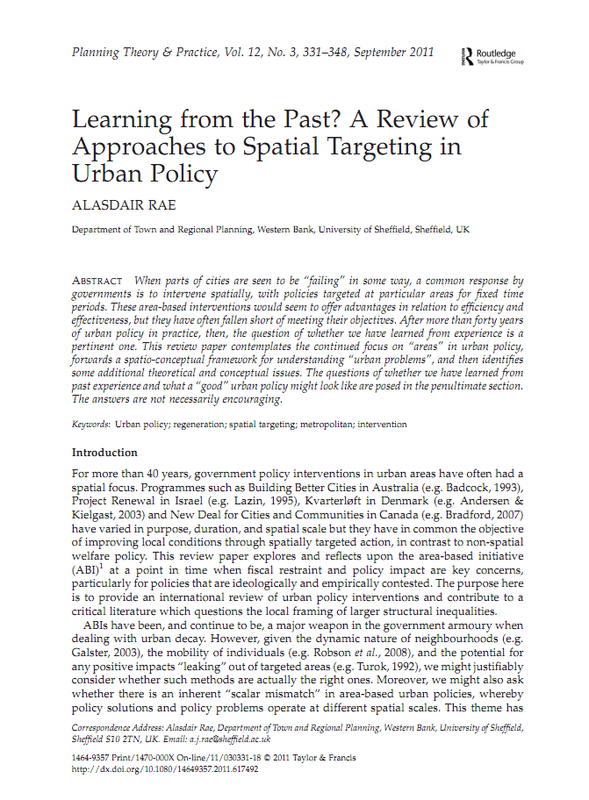 A Review of Approaches to Spatial Targeting in Urban Policy' and it has a lot to say about the issues in the select committee report. Unusually, for me, it also has no maps or stats in it! I look at examples from across the world and my view is that there is a problem with the way we conceptualise the 'problem' in urban policy, but enough about that. "Regeneration to enable growth offers little evidence that the Government has a coherent strategy for addressing the country's regeneration needs. The document lacks strategic direction and fails to target action and resources at the communities most in need. The measures it sets out are unlikely to bring in sufficient resources or to attract the private sector investment that in many areas is badly needed." "We need to think what my people are living in and the conditions they are living in. It is a famous line: we have kids in schools; you ask them to draw a house and they will draw you a house with boarded-up windows, not fancy little curtains or anything else. To me, that is not a future that we can build on, which is criminal. We have a right to have a decent life and place where we live, and that is the one thing that we ask Government. Can we have it? Can we let any Pathfinder area be left with what some people are being left to live in?" As you can tell, the committee are not exactly thrilled with the government's approach to the housing market renewal programme. Regeneration and Renewal used the word 'damning' and that about covers it. "One marked weakness in this strand of policy has been a reluctance on the part of new administrations to learn from previous regeneration initiatives. There is every possibility of this happening again, as a new government launches a regeneration programme with little if any acknowledgement of lessons from previous interventions." My small contribution to the literature effectively finds the same things, and not just in England but more widely in different parts of the world. 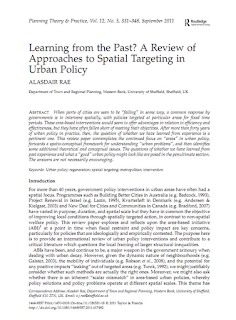 Not learning from the past, however, is not restricted to regeneration but the implications of not doing so here are particularly severe for those living in areas targeted by urban policy. Full details of the inquiry associated with the report can be found here. That's all I have to say for today! Take a look at the report - it makes fascinating reading (though I couldn't find it a pdf version).